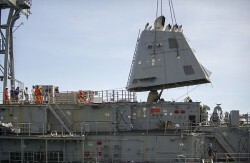 The U.S. Navy has begun the dismantling process for a minesweeper caught on the Tubbataha Reef off the coast of the Philippines Jan. 17, 2013. Crane vessel M/V Jascon 25 removed the funnel of the USS Guardian (MCM-5) on Wednesday in a salvage operation that has been delayed by rough weather, according to local press reports. “Using its dynamic positioning system, Jascon 25 is able to position its crane within reach of the Guardian without requiring traditional mooring equipment that could damage the reef,” the Navy said in a statement. The Japan-based 1,401-ton Guardian ran aground following a port visit to Subic Bay in the Philippines. The Navy is still determining the cause of the grounding, however some Philippine politicians have blamed human error. “The Americans seem to admit that they were sloppy with their map, and that they were arrogant with the Filipino park rangers whose advice they disregarded,” Senator Miriam Defensor Santiago said on Feb. 12. The grounding has raised political tensions between the U.S. and the Philippines over compensation for damage to the reef, which is a protected marine biodiversity area and UNESCO World Heritage Site. Guardian was based in Sasebo, Japan as part of the U.S. Navy’s forward deployed mine sweeping force. Bahrain-based USS Warrior (MCM-10) will transit via heavy lift ship. Warrior is expected to depart the Middle East on Saturday and arrive in Sasebo in late March. Loss of Guardian brings the Navy down to 13 mine countermeasure (MCM) ships. The Avenger-class ships, which entered the Fleet in 1987, are among the oldest in the service’s inventory and will be replaced by the MCM mission package of the Littoral Combat Ship.